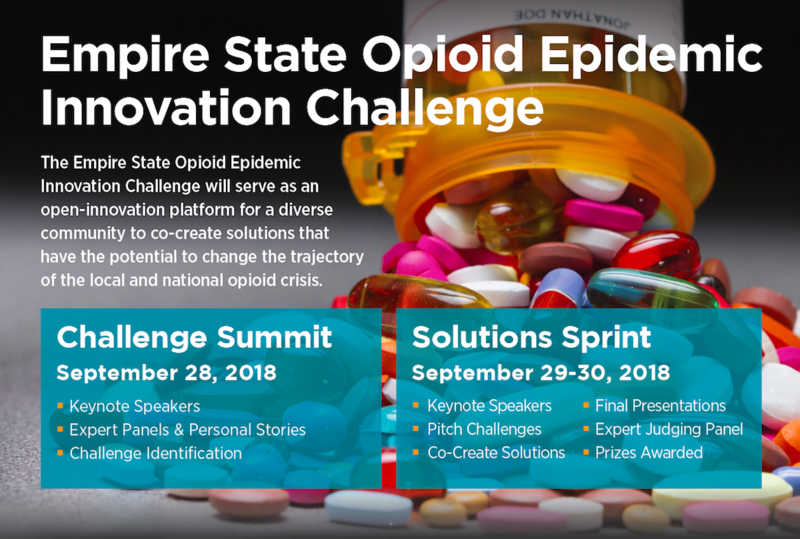 The Empire State Opioid Epidemic Innovation Challenge will serve as an open-innovation platform for a diverse community to co-create solutions that the potential to change the trajectory of the local and national opioid crisis. The Challenge Summit will convene clinicians, government representatives, public health experts and affected community members to facilitate a discussion of challenges and provide critical insight into the opioid epidemic. The Solutions Sprint will serve as an open-innovation platform for a diverse community to co-create innovations over a 48-hour period. Through cross-disciplinary collaboration, mentorship and award incentives, teams can accelerate ideas into breakthrough innovations with the potential to curb the opioid epidemic. Through its “co-creation” model, CAMTech and partners will convene experts in health, engineering and business to increase awareness and generate solutions that can address the prevention, treatment and recovery of opioid addiction. Innovators will develop technologies that are not only user-centric, technologically-disruptive and socially-impactful, but also commercially-viable. Working together, there is the power to effect real change and save lives.